The exceptionally productive e-STUDIO50F is an outstanding multifunction fax and laser printer that copies, faxes, scans and manages your documentsall from a very small 14" x 14.3" space. 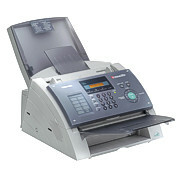 It offers crisp 600 dpi Windows printing, a 100 location Autodialer, 60-page memory, convenience copying, and TWAIN scanning. It does everything you want at a price affordable enough for a single executive, yet efficient enough for a busy workgroup. 5 PPM Plain paper laser output standard fax, PC faxing, printing and scanning. 150 sheet paper capacity.